I have been busy in my stamp room, but everything I made is for my class this Wednesday. So I will have to wait until after Wednesday night to post those items. For now, I decided to upload some my favorite cards that I made in the past. I am going to show you three cards that use the emboss resist technique. This is absolutely one of my all time favorite wow techniques! Come to think of it, I think I may do an emboss resist tutorial sometime soon! This card is just a base with no layers, but I think that it is really outstanding . I started with a base of Whisper White cardstock. I masked areas across the top and bottom with Post-It notes, and then I stamped the images from the Upsy Daisy stamp set in Versamark and embossed them with clear embossing powder. (I took the post-it notes off before using the heat tool, and brushed away any embossing powder that got trapped under the post-its.) I placed fresh post-its and sponged on Classic ink using Sponge Daubers. I used Pear Pizzazz ink along the bottom and Marina Mist ink along the top, so that the inks came together in a wavy line that gave the effect of a landscape. Then I added a little bit of Pacific Point ink along the top edge and to the left corner to add dimension. I buffed excess ink off the image with a paper towel. Then I removed the post-its and stamped the sentiment from Thoughts and Prayers. 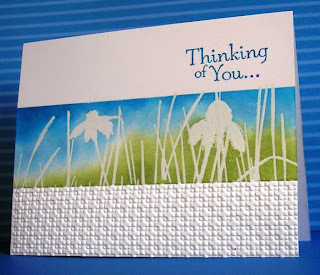 I used a Pacific Point marker to ink up just part of the sentiment so that I would only get the “thinking of you” part. I finished it off by inserting the bottom edge into a Square Lattice Embossing Folder and ran it through my Big Shot. That all there is! By chance, it is another one that uses Upsy Daisy with Emboss Resist. I stamped the image in Versamark on Very Vanilla cardstock. I embossed with clear embossing powder. Then I sponged on Chocolate Chip ink around the image and added a bit of Early Espresso ink in the bottom left. I buffed excess ink off the image with a paper towel. I stamped the sentiment with Early Espresso. I matted with a piece of Chocolate Chip cardstock, and then another piece of Very Vanilla. The card base is Chocolate Chip. The strip behind the main image is inked with Early Espresso using the Baroque Border wheel and then sponged with Chocolate Chip. I added a piece of Very Vanilla 5/8” Satin Ribbon around this strip, and assembled the card. Then I tied a bow from the same ribbon and attached it with Glue Dots. I hope you like it! 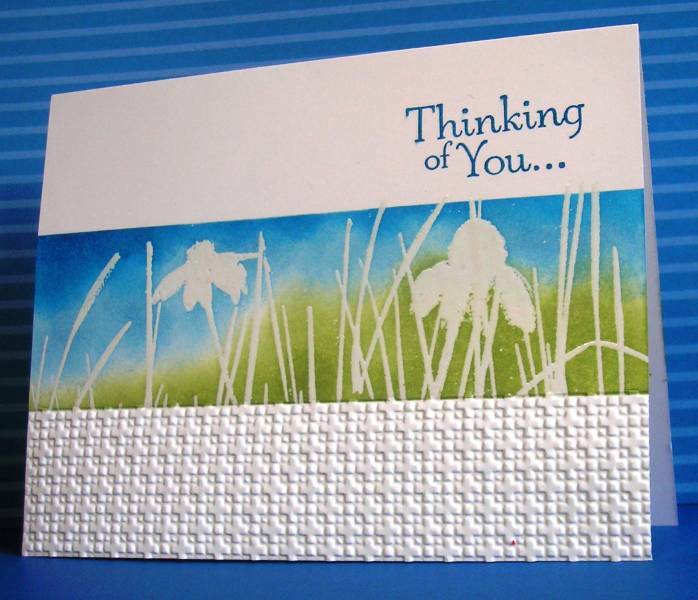 This last card uses the Emerging Color Technique, which is a variation of Emboss Resist. To do this technique, you stamp an image in colored ink. 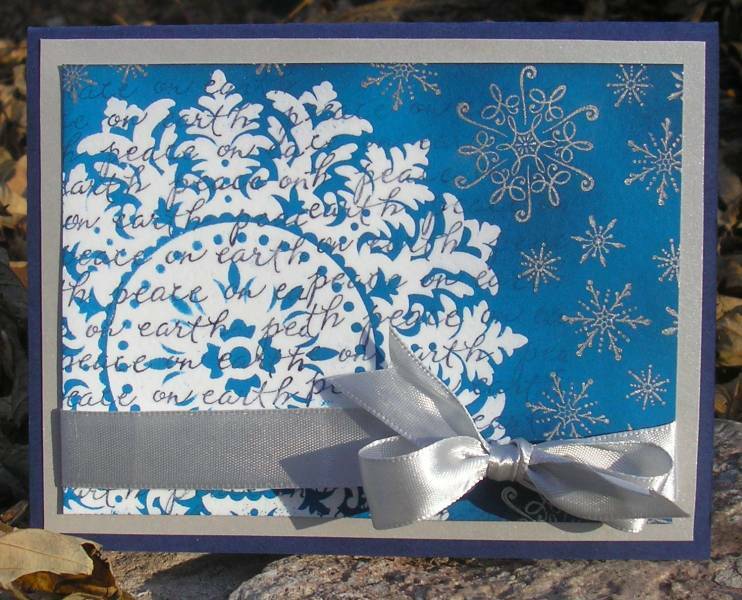 (In this case I used a non-SU stamp that says “Peace on Earth”, stamping in Night of Navy ink on Whisper White cardstock.) Then you stamp over the original image using different image in Versamark and emboss with clear embossing powder. (I used the Medallion stamp.) Then after you have sponged ink around the embossing, the initial image shows through the area of embossing that resist the sponged ink. (Hence the “emerging color”.) On this card I brayered Pacific Point all over the card front, then I sponged on Night of Navy ink around the edges and in random spots along the card. I buffed excess ink off the image with a paper towel, so that the words showed through the Medallion. Finally I stamped on snowflakes from the Serene Snowflakes set in Encore Silver ink. I added a piece of silver satin ribbon from my ribbon scraps drawer. I matted this card front on Brushed Silver cardstock, and then attached that to a Night of Navy card base. That about sums it up! You really are a master of this technique!! Your cards are all just gorgeous! Love all three of your cards...just gorgeous!